If you now turn and start up Science road again the first building on your right is the Wallace Theatre, one of the larger lecture theatres in the University and built in the immediate post-war period. 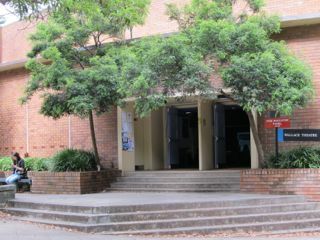 It is perhaps surprising that the Wallace Theatre is listed on the Royal Australian Institute of Architects register of significant 20th century buildings. It is externally an unprepossessing building, built in a hurry in 1946 by the government architect Cobden Parkes to cope with the anticipated rush of returning soldiers wanting to complete their university degrees. A stand-alone lecture theatre it could accommodate 400 and continued to serve this purpose for many years. Given the shortage of materials and pressure on building it was a useful achievement.